The side-scrolling platformer challenges players to save the citizens of Lothal from Imperial control. 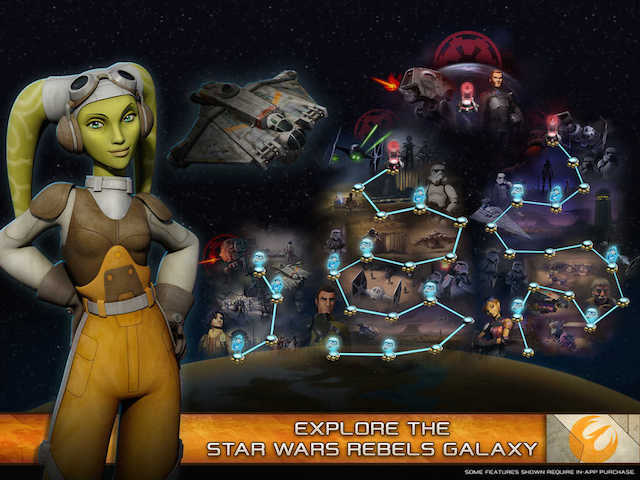 Disney Interactive today released Star Wars Rebels: Recon Missions on mobile devices. The side-scrolling platformer is an extension of the Star Wars Rebels television show, and was created in partnership with developer Gigataur. In Star Wars Rebels: Recon Missions, players take on the role of Ezra Bridger, challenged with defeating the Empire and saving the citizens of Lothal from Imperial control. Gamers complete levels using directional buttons on the left side of the screen to move, while actions, like jumping and shooting, are controlled by buttons on the right side. Each level sees players collecting Hope emblems, the game’s main currency, while three gold medals scattered in each stage give players an optional collection goal while playing. In between missions, players return to the Rebel Haven, which can be customized with shelters, towers, generators, a Droid factory and more. The more shelters players construct, the more citizens they can save while completing missions. Saving citizens gives players a chance to unlock new abilities (like an upgraded weapon, for instance), as they spend their Hope around the Haven. While Star Wars Rebels: Recon Missions is available to download for free, only the first four levels are available in this initial download. An additional 30 missions, and a boss battle, are available to purchase for $4.99. This bundle also unlocks two more characters for play: Kanan Jarrus and Sabine Wren. Star Wars Rebels: Recon Missions is available to download for free on the iTunes App Store, Google Play the Windows Phone Store and the Windows Store.